Wiersma, A. M. and Winship, I. R. (2018). Induction of Photothrombotic Stroke in the Sensorimotor Cortex of Rats and Preparation of Tissue for Analysis of Stroke Volume and Topographical Cortical Localization of Ischemic Infarct. Bio-protocol 8(10): e2861. DOI: 10.21769/BioProtoc.2861. The photothrombotic model of stroke is commonly used in research as it allows the ischemic infarct to be targeted to specific regions of the cortex with high reproducibility and well-defined infarct borders. Unlike other models of stroke, photothrombosis allows the precise size and location of infarct to be tightly controlled with minimal surgical invasion. Photothrombosis is induced when a circulating photosensitive dye is irradiated in vivo, resulting in focal disruption of the endothelium, activation of platelets and occlusion of the microvasculature (Watson et al., 1985; Dietrich et al., 1987; Carmichael, 2005). The protocols here define how photothrombosis can be specifically targeted to the sensorimotor forelimb cortex of rat with high reproducibility. Detailed methods on rat cortical tissue processing to allow for accurate analysis of stroke volume and stereotactic determination of the precise cortical region of ischemic damage are provided. The photothrombotic model of stroke allows for the precise placement of an ischemic infarct in specific regions of the cortex (Carmichael, 2005; Underly and Shih, 2017). Photothrombosis can be used to occlude specific arteries and arterial branches in the cortex (Carmichael et al., 2005), individual vessels of the pia (Taylor and Shih, 2013) and defined cortical areas such as the barrel field (Dietrich et al., 1987) and hind limb somatosensory cortex (Que et al., 1999). Using this approach, highly reproducible ischemic infarcts have been generated in many experimental animal models including rodents (Watson et al., 1985; Carmichael et al., 2005) and non-human primates (Ikeda et al., 2013). Photothrombosis of the forelimb sensorimotor cortex is useful as it results in localized sensorimotor impairment in forelimb use that can be carefully quantified using a variety of behavioral tests after stroke and during recovery (Sist et al., 2014; Wiersma et al., 2017). The methods presented here allows for the induction of consistent ischemic infarcts of the forelimb sensorimotor cortex that result in significant and long-lasting deficits in forelimb motor function (Wiersma et al., 2017). There is currently no standardized method of identifying both the volume of induced stroke and the anatomical location of stroke in the cortex. Here, we provide methods on systematic identification of the precise cortical location of photothrombotic infarct and analysis of stroke volume. Exclusion criteria for animal stroke models are widely varied. Therefore we provide guidelines to establish criteria for exclusion of animals that deviate from expected stroke volumes or stereotaxic locations. Manufacturer: Purdue Pharma, catalog number: 6761815117 . Prior to beginning the surgical preparation make rose bengal solution (Recipe 1) to 100 mg/ml in sterile saline. Note: Ensure that the solution is not exposed to light and that the powder is not exposed to light during storage or while making the solution. Rose bengal solution should be made fresh prior to injection. Remove hair from the surgical field on the rat scalp from the ears to the eyes by cutting hair at the root right next to the skin with a pair of sterile surgical scissors or fur can be shaven with an electric razor. Mount the animal onto the stereotaxic device (Figure 1A). Start by placing one ear bar in the ear canal and tighten into place, then slide the other ear bar into the ear canal until the head can no longer move from left to right. Tighten the second ear bar into place (Figures 1B and 1C). Note: The ear bars have been placed correctly if the head does not shift left to right. Secure the anterior mount or bite bar in the mouth of the rat. Adjust the bite bar until the head is level. The rat is properly secured in the stereotaxic apparatus then the head does not move in any direction when pressure is applied (Figure 1D). Note: Proper placement of the rat in the stereotaxic frame is essential as drilling and thinning of the skull require that there is no movement of the head. Figure 1. 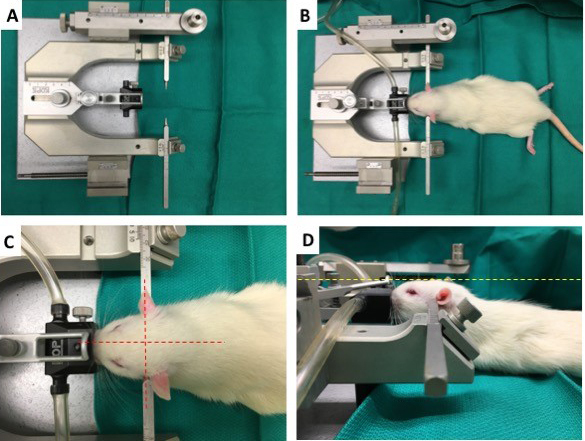 Mounting of rats in a stereotaxic surgical device. A. Standard stereotaxic head frame for rodents, with adjustable ear bars and anesthetic nosecone over the bite bar. B. Rat mounted in a stereotaxic frame with secured ear bars. C. Proper placement of rat head in stereotaxic frame such that the head is centered in the frame as indicated by red dashed lines. D. Proper adjustment of nosecone and bite bar height to ensure the skull is level as indicated by yellow dashed lines. Make a 1 cm incision over the skull midline (Figure 2A), superior to the ear and inferior to the eyes. Expose the skull by retracting each side of the incision away from the midline. 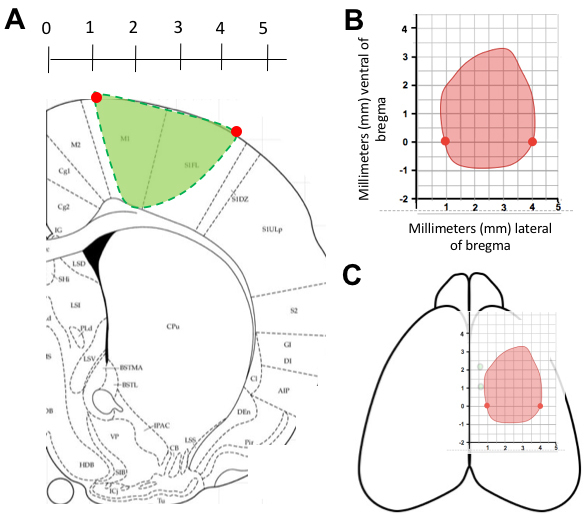 Bregma can now be easily located (Figure 2B), if you have difficulty locating bregma gently push on the skull plate and the sutures will become obvious as they shift under mild pressure. Thin the skull in a rectangle between the marked coordinates (Figures 2D and 2E), 1-4 mm lateral; -1 to +3 mm anterior of bregma, using a surgical drill with endodontic electronic motor system set to a speed of 5,000 rpm fitted with a dental handset fitted and rounded carbide bur drill bit designed for cutting. The skull should be thinned to a thickness of 0.1 mm uniformly over the 3 x 4 mm area. Note: The vasculature underlying the thinned skull should be clearly visible. If you cannot clearly see the underlying vasculature, try adding a drop of sterile saline over the window to clear the window of any particulate generated by the drilling process. If the underlying vascular is not visible after adding a drop of saline, additional thinning is needed, continue thinning the skull until the vascular becomes visible. Figure 2. Photothrombosis of the sensorimotor cortex in rats. A. Location of midline incision to exposed the skull (indicated by the red dashed line) of a rat mounted in stereotaxic frame. B. Surgically exposed skull with; C. the stereotactic coordinates of the thin window corners marked by black circles, established relative to bregma (marked by the yellow circle) using a surgical microscope (5x magnification). D. Thin window of the skull (indicated by the black box) created between the coordinates outlined in; C. Blood vessels under the thinned skull become visible at 5x magnification; E. F. Laser targeted (indicated by green circle) to the blood vessels directly under the thin window to induce an ischemic infarct of the sensorimotor cortex, shown at 5x magnification in; G.
Swab rat tail with warm water to increase visibility of the vein (Figures 3A and 3B). Occlude the vein with non-dominant hand (Figure 3C). Slide the needle into the tail vein with the bevel facing upward and the needle directed parallel to the vein (Figures 3D and 3E). A flash of blood indicates the catheter is in the correct location (Figure 3F). Slide the catheter into the vein and remove the needle (Figure 3G). Ensure there is blood flowing out of the catheter (Figure 3F). Attach needle with rose Bengal. Inject calculated volume (D1) of rose bengal at a rate of 1 ml/min. Flush the catheter with 0.2 ml of sterile saline. Note: Rose bengal can move into the perivascular space following injection leading to ischemia in the tail vein and subsequent necrotic cell death, a saline flush can prevent this complication. Figure 3. Tail vein injection in rats. A. Location of rat tail veins marked with red dashed lines. B. Rotate rat tail 90° so that the tail vein becomes visible. C. Occlude the vein with non-dominant hand. D. With the bevel facing upward align the catheter needle with tail vein. E. Direct the needle parallel to the vein. F. Insert the needle until a flash of blood is visible in the catheter. G. Remove the needle leaving the catheter in the vein. H. Check to ensure blood flow out of the catheter to ensure correct placement. The catheter is now ready for injection. I. After injection remove catheter. J. Apply pressure to allow a clot to form. K. Ensure that the tail looks healthy and blood flow has returned to the tail tip. Put on laser safety glasses. 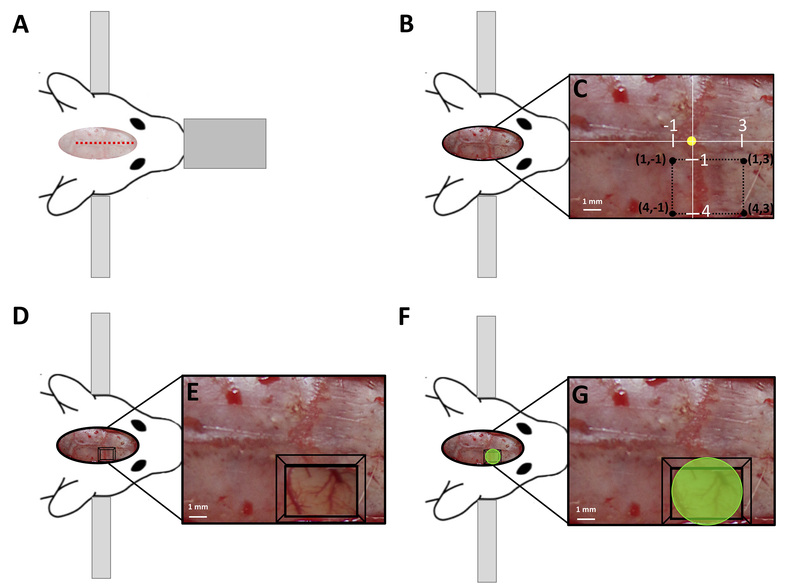 Immediately illuminate the thinned skull over the somatosensory cortex using a collimated beam of green laser light (532 nm, 17 mW; ~4.0 mm beam diameter) for 15 min to photoactivate the Rose Bengal (Figures 2F and 2G), occluding all illuminated cortical vasculature and inducing a focal ischemic infarct. Note: The precise size and location of the laser beam placement will determine the size and location of photothrombotic stroke. The laser beam is turned on immediately after the tail vein injection flush (Step D3), for sham surgical animals follow all of the outlined steps but simply do not turn on the laser during the 15 min exposure time period (skip Step E2). Following the 15 min of laser exposer, suture skull and give analgesic care in accordance with IACUC protocols (0.05 mg/kg subcutaneous buprenorphine). Give a subcutaneous injection of 3 ml sterile saline to prevent dehydration. After surgery when mobility is regained, observe animal for signs of paralysis and weakness in the forelimb associated with the injured cortex. Note: There should be a clear deficit in the injured limb immediately after the procedure. In most cases, this is evident by the rat avoiding use of the stroke lesioned forepaw by lifting and clenching the injured paw while using only the uninjured forepaw for postural support of body weight. Prepare perfusion solutions (4% formalin and Saline with heparin) and allow time to reach correct temperature for use (Recipe 2). Note: See Gage et al. (2012) for a detailed protocol on rodent perfusion. Intraperitoneally inject sodium pentobarbital at 150 mg/kg in accordance with the American Veterinary Medical Association Guidelines for Euthanasia. Example for 500 g rat: Convert rat weight to kg: 500 g = 0.50 kg. Determine the mass in mg of sodium pentobarbital to inject: 0.500 kg x 150 mg/kg = 75 mg. Determine the volume of Euthasol® to inject it is sold at (400 mg/ml): 75 mg/400 mg/ml = 0.188 ml. Wait for surgical plane to be reached then secure animal on its back to a perfusion tray set at 85° (Figure 4A). Lift and pin the rib cage to reveal the coronal chest and release the heart of any attachments to the chest cavity (Figure 4B). Using a hemostat, grip the apex of the heart and insert a blunt ended 16-gauge needle through the left apex, continue insertion into the left ventricle (Figure 4C). Note: It is important to ensure that the needle does not extend past the aortic arch. Make a small incision in the right atria to release fluid pressure and start primed peristaltic perfusion pump at 70-100 ml/min (Figure 4D). Perfuse 250 ml of 37 °C isotonic saline (Celline) Heparin (5,000 IU/L) solution (Recipe 3) to clear all blood from the animal. Switch perfusion fluid to 4% formalin solution at 4 °C, again perfuse 250 ml of the solution at a rate of 70-100 ml/min. Note: Fixative tremors should begin to occur throughout the rat within seconds of the 4% formalin solution being infused and the rat should be very stiff by the end of the perfusion. Figure 4. Transcranial perfusion of rat. A. Rat placed on perfusion tray set at 85°, dashed lines indicate the location of incisions. B. Surgically exposed coronal chest with heart highlighted. C. Insertion of blunt ended 16-gauge needle through the left apex of the heart. D. Incision into the right atria to release fluid pressure and drain perfusion fluids. Decapitate the animal between the cervical spinal cord (C1) and the skull. Create a midline incision spanning the skull and remove all skin to reveal the whole skull. Run the scoop under the brain until all connecting tissue blood vessels are cleared and the brain easily slides out of the open skull. Immediately following removal, place the brain in 50 ml of 4% formalin, leave overnight at 4 °C. After overnight fixation, replace 4% formalin with 4 °C 50 ml of 30% sucrose solution (Recipe 4) and leave tissue for 3-4 days at 4 °C until the brain is no longer buoyant in solution. Cover the brain with a thin layer of OCT freezing media. Submerge the brain in 2-methylbutane solution chilled to -50 °C. Leave the brain submerged for 1 min to ensure the brain is frozen throughout. Note: If the whole brain will be stored for an extended time (more than 2 weeks), the brain should be coated in an additional layer of OCT freezing media. Note: If planning to section the tissue, we do not recommend storage at -80 °C, as the tissue must be warmed to -20 °C for sectioning. We experienced fracturing of tissues and the appearance of freeze-thaw line when we warmed out tissue to optimal sectioning temperature after storage at -80 °C. A cryostat should be set to a temperature between -19 °C and -22 °C, with a cutting thickness of 20 μm for coronal brain slices. Section the whole brain and mount all slices on glass microscope slides. Note: If Immunochemistry will be performed Superfrost® Plus Gold slides are recommended as we found slices did not adhere well to uncoated slides even after baking. Slides can now be counterstained or immunolabeled. Select 10x microscope objective lens on confocal microscope. Note: We use a Leica SP5 Confocal microscope with Leica HCX PL APO L 10x 1.0NA water emersion objective lens and Leica LAS AF Software. The Stroke region can be visualized with a setting for an applied counterstain, immunolabel or in some cases autofluorescence in the FITC emission spectrum can be used to effectively define the stroke borders. 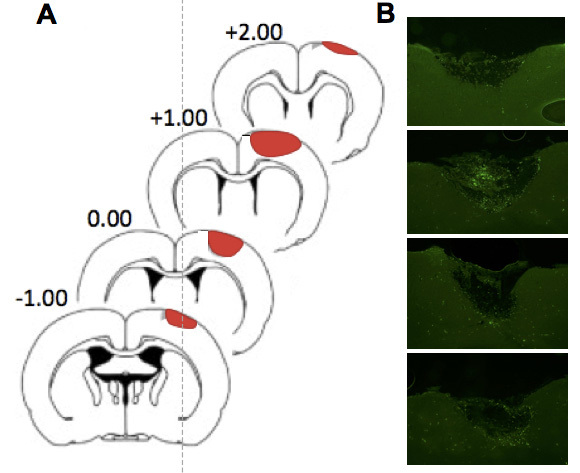 In unstained tissue, the stroke border can be determined using the light differential interference contrast or light-DIC setting. Using microscope software set up parameters to collect tile scan images encompassing the whole brain slice (Figure 5A). Collect images of each brain slice spanning the infarct (Figure 5B). Figure 5. Coronal sections spanning the ischemic infarct. A. Coronal sections of rat brain with the lateral coordinates relative to bregma, the infarct area is shown in red. B. The stroke area corresponding to each coronal slice shown in (A) visualized using spectral settings for the FITC emission spectrum on the confocal microscope at 10x magnification. Adapted from Wiersma et al., 2017. Cortical stoke volume can be determined by analyzing the volume of infarct in each coronal section spanning the ischemic lesion (Figure 5). Import collected images (Procedure I) from each coronal section spanning the stroke imported into ImageJ (Figure 6A). Using the measure function in ImageJ, trace the infarct on each section to determine the specific surface area of the stroke in each slice (Figure 6B). Multiply the surface area by the depth of slice (20 μm) to determine the lesion volume for each slice (Figure 6C). Figure 6. Example calculation of infarct volume for one coronal section. A. The infarct is clearly visible in the slice visualized using spectral settings for the FITC emission spectrum on the confocal microscope at 10x magnification. B. The area of the infarct to trace in ImageJ is shown by the white dashed line. C. ImageJ calculates the surface area of the infarct as outlined in (B), which is multiplied by the slice thickness to provide the stroke volume in the slice. The infarct volumes for every slice spanning the lesion can be summed to determine the total stroke volume. It is important to predetermine exclusion criteria and remove any animals from the study which do not have a minimum predetermined stroke volume (see Data analysis). Cortical maps showing the topographical location of induced stroke are created for each animal by recording the stereotaxic coordinates of stroke boundaries for each coronal slice of tissue spanning the lesion. For each coronal slice spanning the lesion, use a rat atlas to determine the y coordinate of the slice (Figure 7A). Determine the two x coordinates of the stroke boundaries at the established y coordinate (Figure 7A). Plot the coordinates on a grid (Figure 7B). Once all the points are plotted, they can be joined to create an outline of the stroke area (Figure 7C). Figure 7. Finding coordinates for topographic infarct map of the stroke cortex. A. A coronal slice is overlaid on the rat atlas to determine the y coordinates of the stroke, then the x coordinates of the stroke boundary are determined for the slice (red circles). B. The boundary coordinates are transferred onto on to a grid (red circles). This is repeated until all the coordinates are entered and a line can be drawn between points to outline the stroke boundary. C. The grid can then be overlaid on the cortex to demonstrate the stroke location. Adapted from Wiersma et al., 2017. An average topographical map of the stroke area can be created by averaging the stereotactic x coordinates for each y coordinate of the stroke boundaries or the stroke areas can be overlaid to show constancy of infarct size and stereotaxic location. The acceptable location of stroke should be predetermined and animals which have strokes outside of the accepted margins should be removed from the study (see Data analysis). Photothrombotic stroke is highly consistent in volume and location of infarct. We performed n = 52 strokes in male Sprague Dawley Rats and found an average stroke size of 4.424 mm3 with a standard deviation of 0.316 and standard error of 0.0432 (Figure 8A). We would recommend excluding animals with a stroke volume outside of 3 standard deviations from the mean stroke volume. When the topographical representations of all 52 strokes are overlaid, it becomes clear that the location of stroke in the cortex was very constant (Figure 8B). The average stroke topographical map can be created by averaging the x and y coordinates at each point. We would recommend excluding any animal which has coordinate 2 mm away from the average coordinate at any location. When comparing the stroke size between different groups, we used a student’s unpaired two-tailed t-testing to determine if the stroke volumes between groups were significantly different. Figure 8. Data analysis of stroke volume and location. A. Stroke volume of n = 52 animals, with the mean indicated by the long central bar and the standard error bar shown on either side of the mean. B. Topographical cortical map of n = 52 strokes overlaid. Adapted from Wiersma et al., 2017. The photothrombotic stroke model is very reproducible, such that none of the 52 animals given strokes in our study had to be excluded for having strokes volumes more than 3 standard deviations away from the mean. All of the animals receiving strokes in our study showed significant behavioral deficits as a result of the ischemic lesion. Note: All weighing and measuring steps should be done in minimal light. Add saline to rose bengal, mix vigorously until all rose bengal is in solution. Note: Once rose bengal is in solution it is very light sensitive, and any light exposure should be avoided. Rose Bengal solution should be used within 4 h after making it. Carmichael, S. T. (2005). Rodent models of focal stroke: size, mechanism, and purpose. NeuroRx 2(3): 396-409. Carmichael, S. T., Archibeque, I., Luke, L., Nolan, T., Momiy, J. and Li, S. (2005). Growth-associated gene expression after stroke: evidence for a growth-promoting region in peri-infarct cortex. Exp Neurol 193(2): 291-311. Dietrich, W. D., Watson, B. D., Busto, R., Ginsberg, M. D. (1987). Metabolic plasticity following cortical infarction: a 2-deoxyglucose study. In: Raichel, M. E. and Powers, W. J. (Eds). Cerebrovascular disorders. Raven Press pp: 285-295. Gage, G. J., Kipke, D. R. and Shain, W. (2012). Whole animal perfusion fixation for rodents. J Vis Exp (65). Ikeda, S., Harada, K., Ohwatashi, A., Kamikawa, Y., Yoshida, A. and Kawahira, K. (2013). 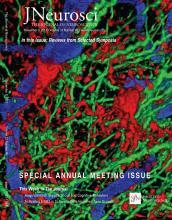 A new non-human primate model of photochemically induced cerebral infarction. PLoS One 8(3): e60037. Que, M., Schiene, K., Witte, O. W. and Zilles, K. (1999). Widespread up-regulation of N-methyl-D-aspartate receptors after focal photothrombotic lesion in rat brain. Neurosci Lett 273(2): 77-80. Sist, B., Fouad, K. and Winship, I. R. (2014). Plasticity beyond peri-infarct cortex: spinal up regulation of structural plasticity, neurotrophins, and inflammatory cytokines during recovery from cortical stroke. Exp Neurol 252: 47-56. Taylor, Z. J. and Shih, A. Y. (2013). Targeted occlusion of individual pial vessels of mouse cortex. Bio-Protocol e897. Underly, R. G. and Shih, A. Y. (2017). Photothrombotic induction of capillary ischemia in the mouse cortex during in vivo two-photon imaging. Bio-protocol e2378. Watson, B. D., Dietrich, W. D., Busto, R., Wachtel, M. S. and Ginsberg, M. D. (1985). Induction of reproducible brain infarction by photochemically initiated thrombosis. Ann Neurol 17(5): 497-504.